Goncharova, together with her husband, the painter Mikhail Larinov, pioneered the Russian Rayonist movement. Using bold colors, they focused on the ways that rays of light reflect off different objects. In Rayonist Garden: Park, the presence of a rainbow underscores this interest in light. 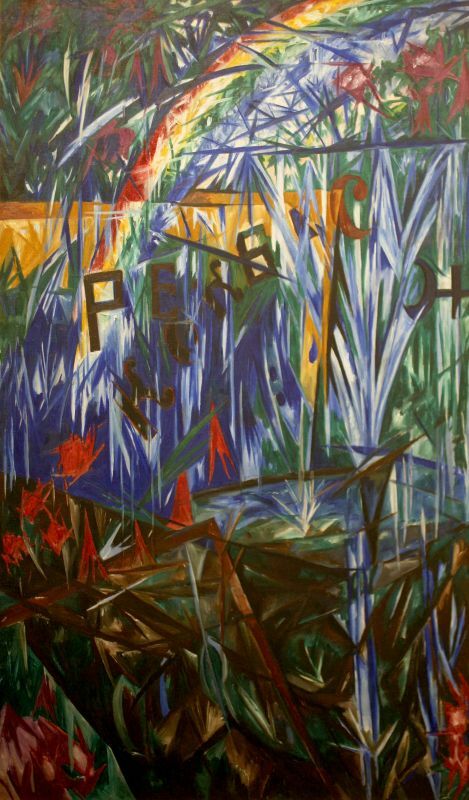 The Russian word for “river” appears prominently in Cyrillic characters, punctuating the artist’s vision of a park, along with the landscape elements of sky, water, and foliage.